Greg Thomas has his work cut out for him, but he’s hopeful that a systematic approach and good weather will help him restore the Rookery South golf course to a better condition. Last summer’s hot, wet weather took a toll on the 17-year-old golf course. Two greens, the fifth and twelfth holes on the east side of the property, had to be re-sodded completely when the existing turf gave up the ghost. 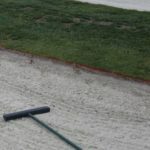 In addition to that expensive repair, other parts of the course suffered from wet wilt, grub worms, and other maladies. 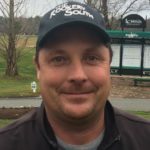 Last fall, Rookery co-owner Chris Adkins brought Thomas over from Hooper’s Landing, where he’d worked for Adkins’ course management company for several years. Thomas holds a Turf Management Technology degree from Wayne Community College in Goldsboro, NC. He was assistant golf superintendent for Rehoboth Beach Country Club for eight years, and dealt with Sussex County weather and turf challenges at other courses. A red line shows where the edging was to finish, on one of the church pew bunkers at Rookery South. For the last couple weeks, Thomas and his winter crew have been replacing guardrails on the bridge to the 15th green and 16th tee box. They are also busy with other traditional wintertime projects, such as restoring the edges of bunkers throughout the course, including the challenging church pews splitting the 10th fairway. “I have a good idea about what needs to be done, but Mother Nature needs to help,” Thomas said. As he explained, the grass restoration efforts require soil and air temperatures in the “50s and 60s.” While the Cape Region has had a relatively mild winter, it is still too early for some of the repairs. “Thatch is a big issue,” Thomas said. “We have to aerify the greens and some of the other areas, and do sand topdressing. The sand lets in the air and gives the water a place to drain. If the thatch is too compacted, the grass roots suffer. Your grass is only as healthy as the roots, and they need to go deep,” he said. We checked out a few patches of grub worm damage on the 10th fairway, about 120 yards from the green. 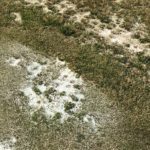 “These areas can be aerified and slit-seeded, and they can come back,” Thomas said. On several greens and some fringe areas surrounding them, such as the fourth and 13th holes, the first steps toward replacing small patches of dead grass are already underway. Using what I call the Hair Club for Men approach, small plugs of healthy turf were placed into these bald areas last fall. According to Thomas, when the greens are aerified again and weather warms up, the patches of creeping bentgrass should spread and fill in the remaining spots. We also walked the eastern slope off the 17th green, where one of my recent tee shots on the par-3 hole plugged into the turf, with only a half-inch wide bit of ball visible. This area feels frankly squishy. Thomas believes this may be yet another example of the thatch problem he’s noted elsewhere, and not necessarily anything to do with the drainage or irrigation system for the hole. “There’s a lot to do here. I’m going to work on what’s in play first, and then get to the other areas,” he said. Thomas plays a little golf himself, and that experience will have an impact on how the course is set up for play. “I’m going to make sure we use all of the putting areas for the hole locations. And I have anything to do with it, the greens will be running faster,” he said. At the 2017 PGA Merchandise Show, I met John Iacono, President of Zero Friction, to chat about the company’s new golf balls and their unique yardage-measuring golf glove. The company is best known for their Zero Friction golf tees, but it has branched out into other golf products. At last year’s Show, I learned about their new affiliation with NBC golf commentator and major winner Johnny Miller, for a new one-size-fits-all golf glove. Iacono proudly showed me their newest innovation, the Distance Pro GPS Glove. A small display device slides onto the flap that closes the glove on the back of the hand. This device is synced via Bluetooth to the golfer’s smart phone. As with other GPS tools, the read-out shows the distance to the front, middle, and back of the green. 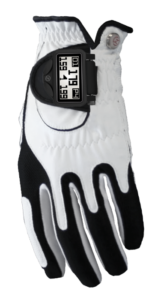 In addition to the GPS unit, the product comes with the smart phone app, and two Zero Friction gloves in white and black. The app is compatible with both Android and IOS systems. Depending on the glove models selected, the suggested retail price ranges from $139.99 to $159.99. I also checked out their new Tour Spin balls, in both 2- and 3-piece designs. Iacono said the 312-dimple pattern is 25% fewer than other balls, which he believes will help with both distance and accuracy. For golf clubs, Zero Friction also offers a logo program. With a wink, Iacono opened up one of the ball packages, and withdrew a Zero Friction tee, which comes with each 3-ball box. We both wondered aloud why no one seemed to think of that before. The 2-piece balls retail for $16.95/dozen, and the 3-piece ZF Distance 312 balls sell for $24.95/dozen. Miller came into the ZF booth area while I was there, and Iacono introduced me to him. As Miller discussed his belief in the company’s products that led him to become an investor, he took off his red Zero Friction hat, autographed it, and handed it over. That was a very nice gesture. I plan to return the favor by donating this hat to the Delaware First Tee Program, for an auction at one of its upcoming fundraisers. Zero Friction products can be found at Ruddo’s Golf on Route One, Heritage Shores in Bridgeville, and at Lighthouse Sound near Ocean City.